The Opening Night of Tribeca Film Festival On The Road Was A Hit | Birth.Movies.Death. The Tribeca Film Festival On The Road series opened in Houston Friday night with one great feature film, one great short and one great party. Friday night the Tribeca Film Festival On The Road series hit the Houston West Oaks Alamo Drafthouse, and it was an absolute blast. The opening night screening was David M. Rosenthal’s Janie Jones, preceded by the award-winning short Mr. Stache. The opening night reception was held at seafood and steak restaurant Eddie V’s with Rosenthal and Janie Jones herself, Abigail Breslin, in attendance. The event was sponsored by American Express and offered exclusively to their cardholders, with cocktails and appetizers happily provided during the screenings and the reception. The evening began with star Abigail Breslin and director David M. Rosenthal walking the red carpet. Before the screening, Geoffrey Gilmore, the Chief Creative Officer of Tribeca Enterprises, gave an intro discussing the importance of film festivals in helping independent films find audiences. With the advent of Video On Demand, that overwhelming task is made a little easier, but we’d never get to see movies like Janie Jones without the buzz generated by film festivals. Gilmore said that the Tribeca Film Festival was created in an effort to revive the community after the devastation of 9/11, and the festival is a huge success today. Mr. Stache, a short film directed by Jac Schaeffer, aired before Janie Jones. The short won the “My Movie Pitch” contest launched by American Express to bring unconventional movie ideas to life, and the film is a charming, eight-minute delight. Starring Rich Sommer and Amy Smart, Mr. Stache is about a man who grows a “proper lip sweater,” loses his disapproving friends and gains true love. 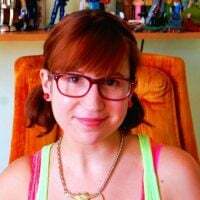 The film features a cute voice-over that says things like, “He thought they were in it together, like The A-Team but with less people and one girl and no missions–but a team nonetheless.” I’ve always been pro-stache, so it should come as no surprise that I loved it. Watch the trailer here. 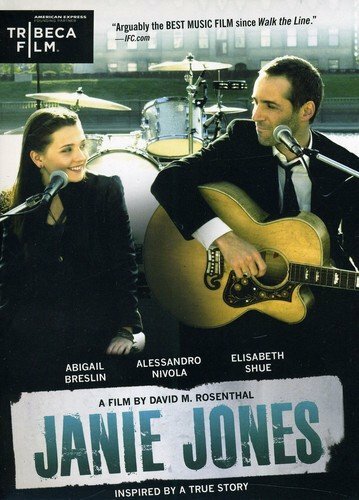 We were then treated to the opening night feature, Janie Jones, a warm and honest film about fading rock star Ethan Brand (Alessandro Nivola), who learns from a past groupie fling (Elisabeth Shue) that he has a thirteen-year-old daughter (Abigail Breslin). Janie’s drug-addled mother drops her on Ethan and splits, and Ethan must wrangle a daughter on his band’s tour. The premise is familiar, but the execution is stunningly authentic. Writer/director Rosenthal spoke a bit during the Q&A about his personal life informing the film, as he first met his eleven-year-old daughter when he was thirty. Nivola and Shue both give wonderful performances, but Breslin is an incredible revelation in the film. It would be so easy to play Janie as a cynical, hardened teen, but Breslin gives the performance a touching vulnerability that deeply enriches the character. She also sings beautifully in the film, as does Nivola. The music is lovely and adds so much to the story. Breslin and Nivola’s chemistry is what absolutely sells the film in a tremendous way, and the audience buys into some very painful stuff because of it. This is a movie that makes no easy choices, and that’s what makes it resonate. Rosenthal, Breslin and producer Keith Kjarval gave a revealing Q&A after the film. Rosenthal discussed his personal story; he’d felt a lot of guilt and reticence when he first met his daughter. They were in the hallway of her middle school and she just ran up to him and threw herself into his arms, and he felt his life change in an instant. He marveled at the fact that she’d carried no baggage or resentment before that day, and a similar scene in Janie Jones was absolutely the most moving moment of the film. Rosenthal also mentioned that he was very much affected by Paper Moon as a child, and Janie Jones was similarly influenced by that film. Rosenthal wrote Ethan as a rock star because he loves music, and because he knows his own industry is incredibly ego-centric, but he feels that the rock star industry is even more so. He told us that he is very close to his now-grown daughter, who was his assistant on Janie Jones. He said that she’s seen every version of the film and loves it. With his own relationship informing the characters, he was so impressed with the authenticity of the chemistry between Abigail Breslin and Alessandro Nivola. He said that Abigail Breslin was the first actor cast in the film; “In the beginning, there was Abigail. And can you imagine anyone else in the whole world doing a better job with this part?” I honestly cannot. After watching Breslin play such a strong, mature character on the film, it was a refreshing surprise to hear her sound like a cheerful, typical teenager. She said she likes to play characters who are more mature, ”cooler and stronger” than she is because she hopes it will rub off on her and one day she’ll wake up “a brand new person.” Despite the wonderful job she did with the songs in Janie Jones, she said she’d never sung before the film other than at a church Christmas party, and Rosenthal commented that her performance in the studio was remarkable considering that. Breslin said that she’s never felt too boxed in as “the girl from Little Miss Sunshine;” she likes playing different characters and she felt that she’d never played anyone like Janie before. Producer Keith Kjarval spoke to his involvement, saying that they made the film during the global economic meltdown. He’s of the belief that to get a film made, you have to be incredibly persistent, willing to make one hundred phone calls or get on ten planes and always know that one of those will be successful. He said you have to be willing to fight for a film, and after speaking to David M. Rosenthal, hearing his personal story and his passion for the film, Kjarval was willing to fight for Janie Jones. And I’m so glad he was, because this is a truly special movie that deserves to be seen. You can watch the trailer here. Tune in tomorrow for reviews and Q&As from The Last Rites of Joe May, featuring a stunning performance by Dennis Farina, and Vincent D’onofrio’s slasher musical Don’t Go In The Woods!